The Geep is a General Purpose Vehicle! Home /The Geep is a General Purpose Vehicle! Well, now, isn’t this just interesting? This may be old news to some of you but the jeep was a general purpose vehicle! Now how in the world can that be you ask incredulously? Where do I come up with such heresy? After all it was a command and recon car or lightweight liaison vehicle, right? Well, I have been doing some research into some early documents. The same Book 120 also defines “truck”. Trucks are “motor-propelled vehicles designed primarily for carrying cargo or equipment. They may be used for carrying personnel or for towing purposes.” Still further it provides a chart that lists the Truck, 1/4-ton, 4×4, Ford, 1941. The chart defines ‘purpose’ for us. “The purpose will be indicated by stating the general character of the body or the use for which the vehicle is designed.& The trucks maybe for “cargo, light repair, reconnaissance, dump, tank, cargo and dump, wrecking, or pick-up.” The jeep?s ( or Geep!) purpose is reconnaissance. I have found and are currently studying the papers of the Chief of Infantry ( Gen. Lynch ) during the initial development of the jeep. It is very interesting reading. . . . comparing some of the information to the ‘official’ QMC version (Rifkind) or the papers of Col Dow. 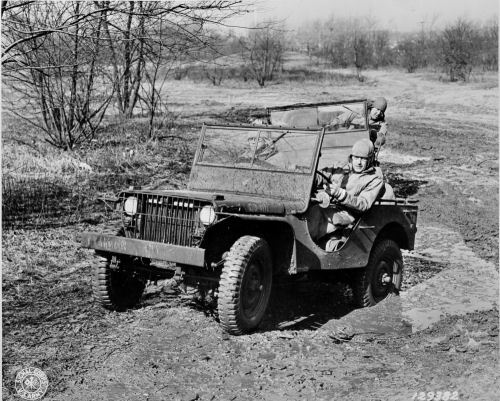 Some may claim that he was just another General Army officer seeking to claim credit for the jeep. Of course he and another officer mention that problem back in the early 40s! Still General Lynch retired approximately May 1941 but would be called upon by Federal authorities on several occasions to testify what he knew concerning the development and introduction of the WW2 jeep (this would continue on into the mid-1950s). Also mentioned in the documents are Mr. Wells. The fellow who wrote “Hail to the Jeep”. It shows documentation that he had permission from the War Department to discuss the jeep history with any of the officers involved. There is correspondence between Wells and the Chief of Infantry. At any rate I am still digesting this information. Including the June 6, 1940 memo that described the basic characteristics of the jeep BEFORE the army committee went to visit with the Bantam folks. But more about that next time.